The photometer LM 10 is an innovative device to determine the quality of light at a light source. The universal application makes the photometer LM 10 a multi- analyzer for lighting. Apart from the sensor for illuminance gauging in visible spectrums between 480 ... 660 nm, you can also purchase sensors for the infrared spectrum 880 ... 1100 nm, the ultraviolet spectrum 200 ... 370 nm, for the color temperature or a sensor with 6 selective spectral bands can be applied at the photometer LM 10. The sensors for color temperature and for spectral band measurement by the photometer LM 10 are in development and will be purchasable from 3rd quarter of 2013 on. For each illuminance depending on the connecting sensor, the photometer LM 10 indicates the flicker percentage of the light source in percentage and the respective frequency as well. The flicker frequency can also be depict via the integrated loud speakers of the photometer LM 10 as an acoustic signal. In order to ensure an acoustic indication of the flicker frequency even in loud environments, the photometer LM 10 holds the option to connect head phones. 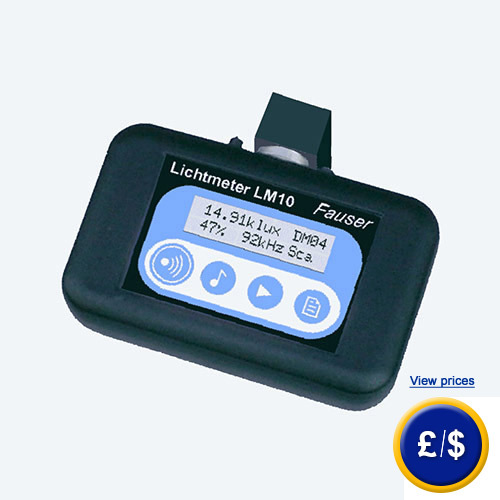 The multifunctional, 2-spaced display of the photometer LM 10 displays the current index of the measurement parameter, information on logger state and battery state as well as the connected sensors and an acoustic reproduction. The photometer LM 10 is of course equipped with a background light. Apart from the standard type photometer LM 10, the upgraded models feature a storage and USB and voltage output. If there are any questions about this photometer LM 10, please have a look at the technical specification below or call: UK customers +44(0) 23 809 870 30 / US customers +1-410-387-7703. Our technicians and engineers will gladly advise you in all light meters and all products in the field of measuring instruments, regulation and control and scales.